Pedro Américo (1843–1905), Joan of Arc Hearing Voices (1884), oil on canvas, 229 x 156 cm, Museu Nacional de Belas Artes, Rio de Janeiro, Brazil. Wikimedia Commons. Ever since Joan of Arc was burnt at the stake in 1431, she has been a semi-legendary figure symbolising the fight for independence of the French people and nation. Since 1920, there has been a French National celebration of Joan of Arc and nationalism on the second Sunday in May, which is close to her saint’s day of 30 May. 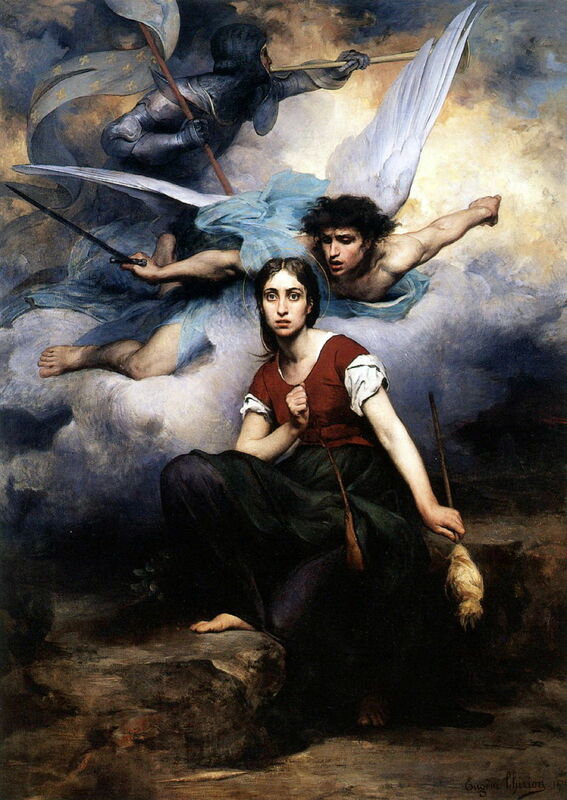 Known in English as Joan of Arc, her real name is the subject of debate. She spelt her first name as Jehanne, the mediaeval version of the modern Jeanne, and most modern French sources refer to her as Jeanne d’Arc. Not that she came from a place named Arc, but that her father’s surname was something like Darc. Joan herself stated that she was known by her mother’s surname, which would have either made her Jehanne Romée or de Vouthon. Forgive me if I refer to her simply as Joan of Arc, for all its inaccuracies. Joan was born in the French village of Domrémy, in the north east of France, in about 1412 – a time when much of northern France was controlled by King Henry VI of England. When she was about thirteen years old, she experienced her first vision, in which saints charged her to drive the English out of France and bring the Dauphin, the future French King Charles VII, to Reims for his coronation. When she was about sixteen, she started on this mission, eventually managing to be taken to the Dauphin. Following a commission of inquiry into her life, she joined the French forces who were trying to disperse and defeat the English, who were besieging the French city of Orléans, and was instrumental in the rapid French victory there, forcing the English to retreat. Joan was given a strategic role in the French forces, and this led to a series of French victories which enabled the liberation of Reims, where the Dauphin was crowned on 17 July 1429. On 29 December, Joan and her family were ennobled in recognition of her personal valour, and for her strategic successes. After a short truce between the French and English, Joan was back in action at Compiègne in 1430, where she was captured by Burgundian forces, who handed her over to the English in return for a substantial ransom. Joan was transferred to Rouen, where she was tried for heresy, ostensibly under the procedures of the Inquisition. However, almost every aspect of the trial was rigged or flawed, and she was additionally charged with ‘cross-dressing’ in male military clothing. Eventually, in 1431, Joan was condemned to death, and was burnt at the stake in Rouen on 30 May 1431. To ensure that nothing remained, the English burned her body twice more, and cast her ashes into the River Seine. This first article focuses on Joan’s visions, in particular that when she was about thirteen, in which Saint Margaret, Saint Catherine, and Saint Michael appeared to her, and told of her destiny. This took place when she was in her father’s garden, but her accounts also refer to subsequent divine communications when she was tending the family’s flock of sheep, which were probably further visions and/or hearing voices. Joan of Arc’s story was extensively featured in miniatures from soon after her execution, but does not seem to have become particularly popular in full-sized paintings until the late nineteenth century. 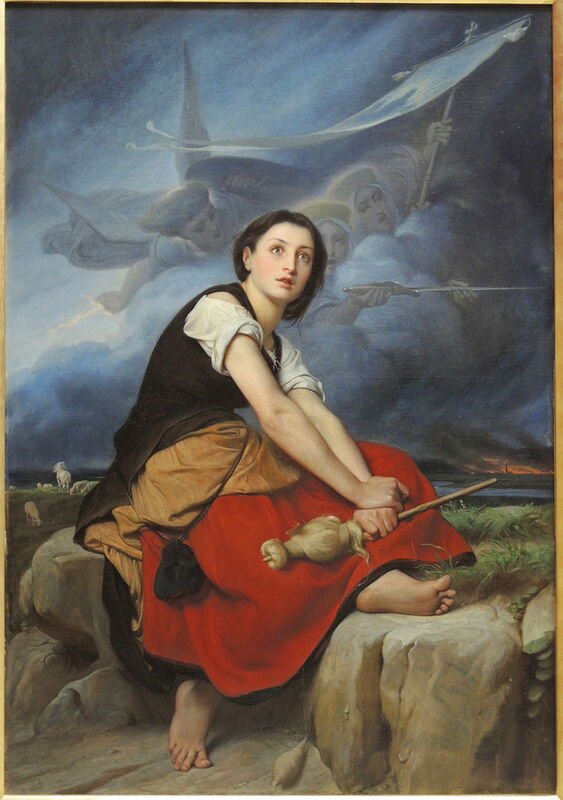 Among the first of this new rush of depictions of Joan’s visions is the short-lived artist Léon-François Bénouville’s Joan of Arc Hearing Voices probably from around 1850 (he died in 1859). This is a curious composite of different episodes from her visions and life: Joan is clearly much older than thirteen, and is not in her father’s garden, but apparently spinning while tending her father’s sheep. In the distance, a town is burning, referring either generally to the war being waged by the English, or one of the actions in which Joan became involved. The figures shown very effectively in the clouds include at least two female saints, and may therefore refer to Joan’s initial vision of Saints Margaret, Catherine, and Michael, but no clues are apparent from any of their attributes. Following France’s ignominious defeat in the Franco-Prussian War of 1870-71, there was a surge in ‘revanchism’, nationalistic feelings driving avengeance of the defeat, typically by reclaiming the lost territories of Alsace-Lorraine, which included a small part of the Vosges, in which Joan was born (although her village was not a part which was annexed to Germany). Paintings of Joan of Arc were suddenly in great demand. 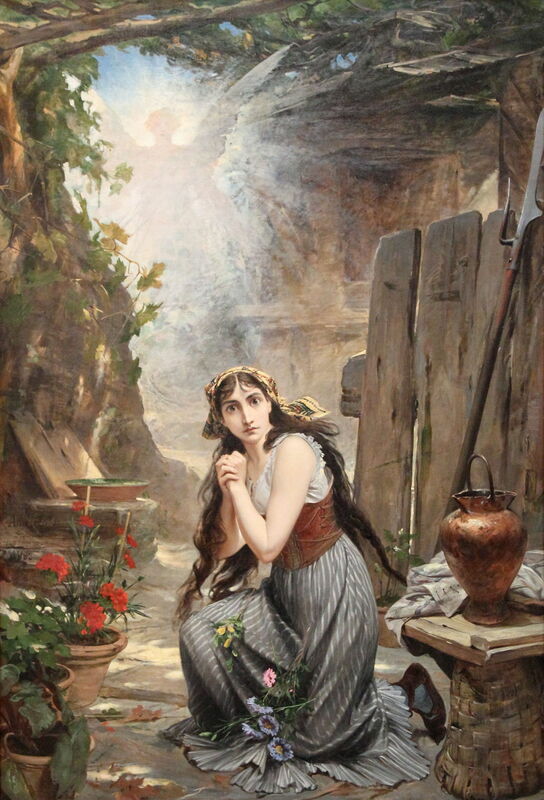 Eugène Romain Thirion (1839–1910), Joan of Arc Hearing Voices (1876), oil on canvas, dimensions not known, Église Notre-Dame, Ville de Chatou, France. Wikimedia Commons. Among those is Eugène Romain Thirion’s Joan of Arc Hearing Voices (1876), which has some interesting similarities with Bénouville’s painting. Joan is again considerably older than thirteen, and seen out on the land spinning, presumably with the family’s sheep. The distant town is too dark to determine whether it is burning, and the sole saint in Joan’s vision is Michael, who is accompanied by a standard-bearing herald. Jules Bastien-Lepage (1848–1884), Joan of Arc (1879), oil on canvas, 254 × 279.4 cm, The Metropolitan Museum of Art, New York, NY. Courtesy of The Metropolitan Museum of Art, via Wikimedia Commons. 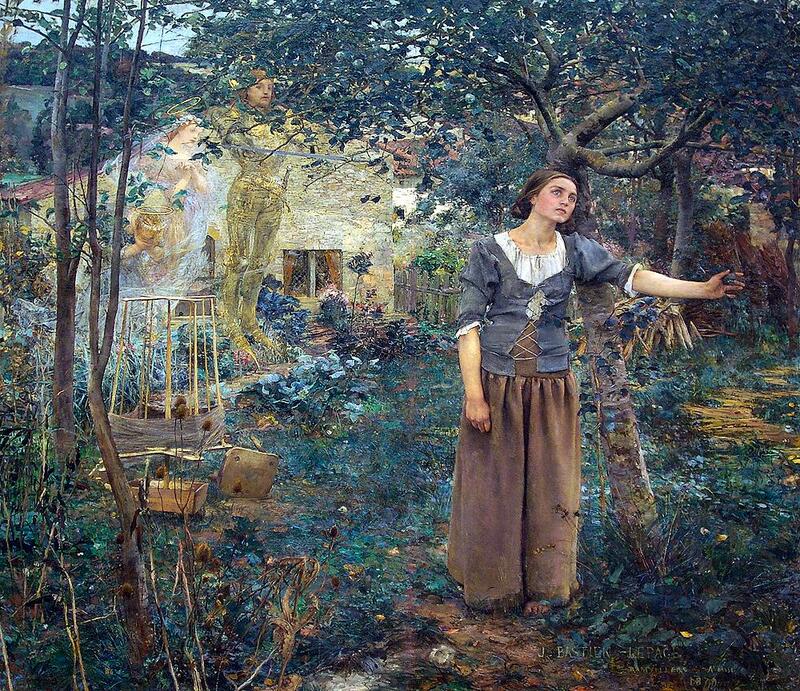 My favourite painting of the calling of Joan has to be Jules Bastien-Lepage’s Joan of Arc (1879), which is also perhaps the most faithful to her evidence at trial. Here she is in her father’s garden, although visibly far older than thirteen. She has been disturbed while spinning – or, strictly, winding wool using a spinner’s weasel – and the three saints are visible behind her, Saint Michael resplendent in a suit of armour. The wool which she was winding also has symbolic meaning, with its reference to the thread of life. Pedro Américo’s Joan of Arc Hearing Voices (1884) is also quite faithful to the story, and for once shows a rather younger girl. This is set in Joan’s father’s garden, although the only figure visible in the vision is that of Saint Michael. As with Bastien-Lepage, Joan’s face reveals her shock at what she has heard, although she is actually facing away from the vision that we can see. 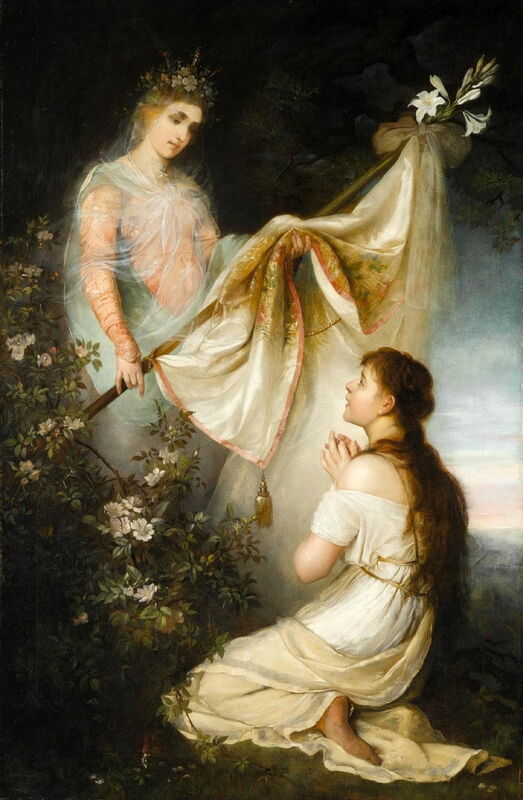 Henryk Siemiradzki (1843–1902), Joan of Arc Kneeling Before an Angel (date not known), oil on canvas, 136 x 90 cm, Private collection. Wikimedia Commons. I do not have a date for Henryk Siemiradzki’s Joan of Arc Kneeling Before an Angel, but suspect that is was painted at about this time too. Unusually, Joan is kneeling in prayer and supplication in front of quite a substantial wingless figure bearing a royal standard. The top of the standard is decorated with white lilies – a highly appropriate symbol of chastity and virginity, although more commonly associated with the Annunciation to the Virgin Mary. Gari Melchers (1860–1932), Joan of Arc (date not known), oil on canvas, 76.2 × 58.4 cm, Indianapolis Museum of Art, Indianapolis, IN. Wikimedia Commons. By the end of the nineteenth century, any association with revanchism must have been long forgotten. 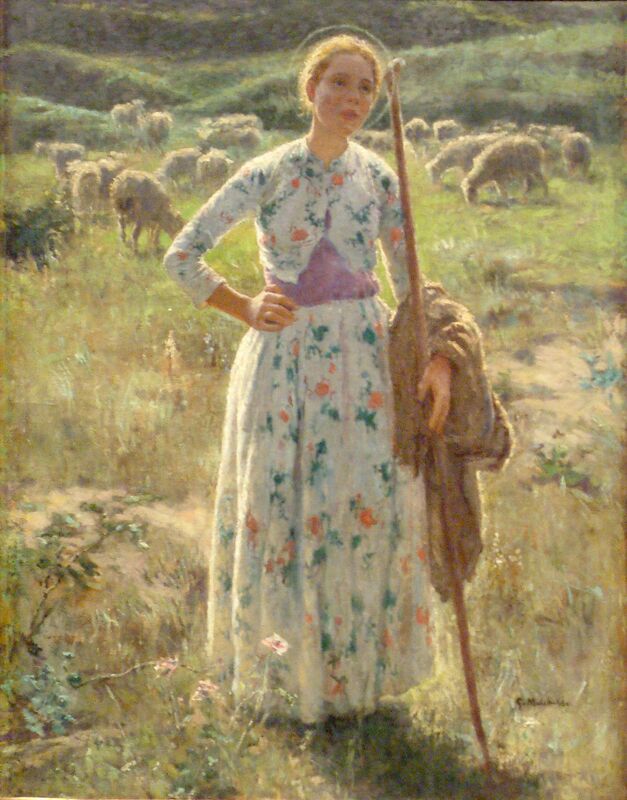 Gari Melchers’ Joan of Arc, probably from around 1900, shows a young Joan tending her sheep, her halo the only indication that this is not an ordinary pastoral portrait. This is also a fascinating choice of motif for Melchers – a native of Detroit, MI, who trained in Düsseldorf and Paris, and might perhaps have painted this when in France. 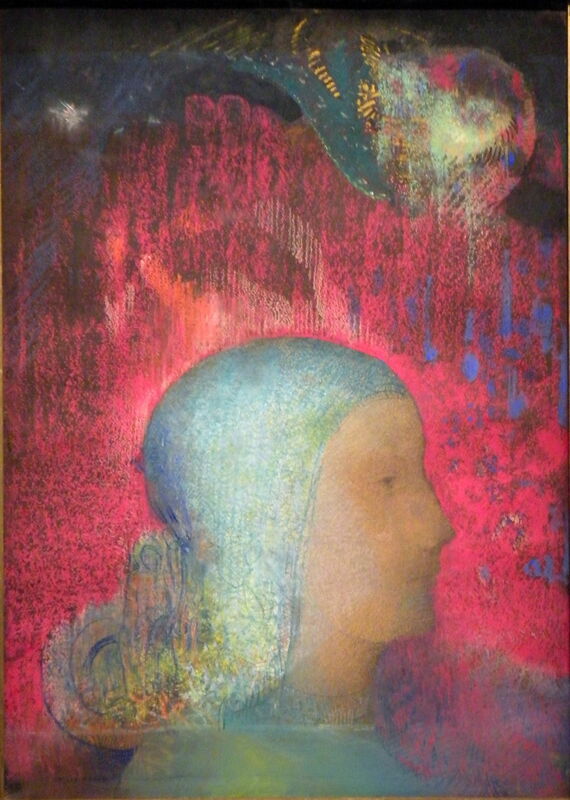 Odilon Redon’s Profile on Red Meanderings, also from about 1900, has been proposed as a portrait of Joan of Arc, which would perhaps fit with some of the passages around the head. I have yet to see an explanatory reading, though. 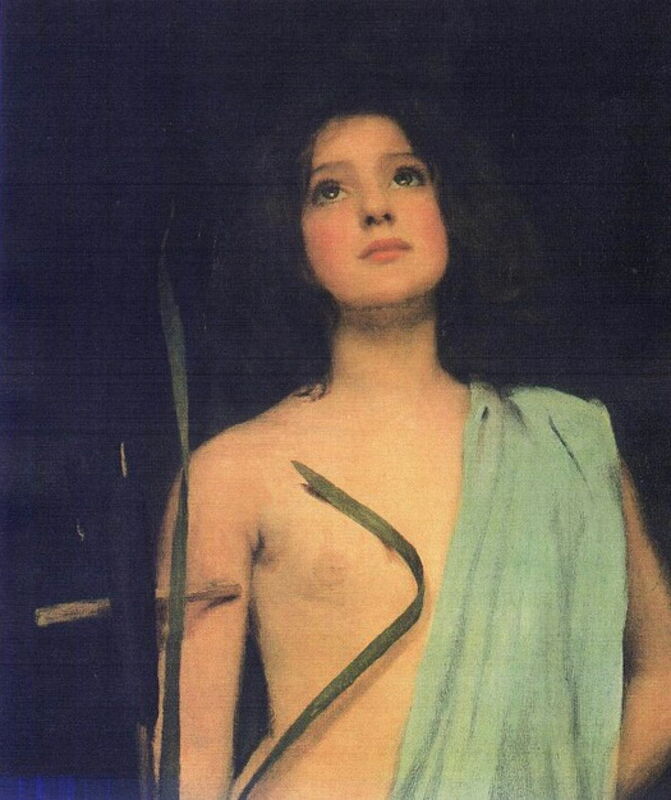 John William Waterhouse (1849–1917), St. Joan (date not known), oil on canvas, 48 × 55 cm, Private collection. Wikimedia Commons. John William Waterhouse’s St. Joan is undated, but probably from the late nineteenth century to about 1900. It is the simplest depiction that I have seen, and the closest to Joan’s age at the time of her first vision. As with Melcher’s painting, it makes no attempt to show any vision, although bright lights are reflected in her eyes. My final painting is by the little-known Pre-Raphaelite Eleanor Fortescue-Brickdale, of Joan of Arc Praying (1919). 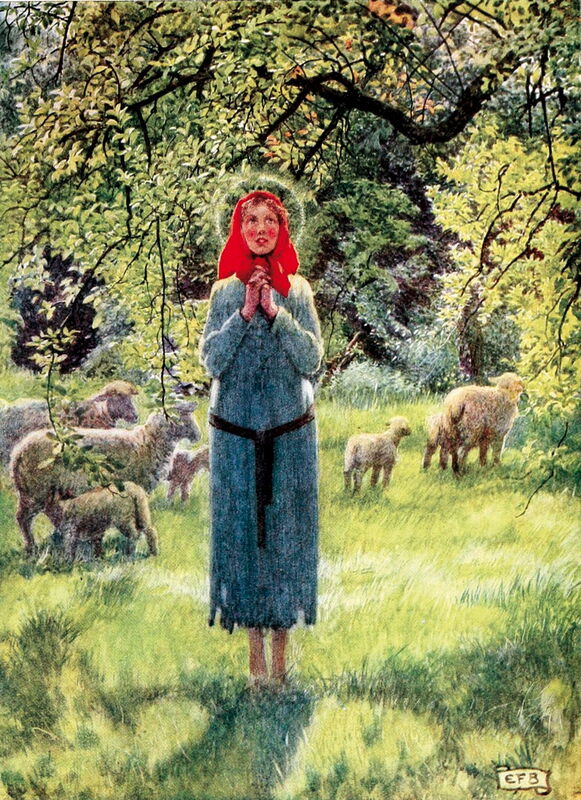 Joan is shown as a poor peasant girl, praying among the sheep grazing in the countryside. This was used as an illustration in the artist’s Golden Book of Famous Women, and shows a new turn in her symbolism, to that of the ’emancipation’ of women in the early twentieth century. In less than a hundred years, paintings of Joan’s divine visions had gone from French nationalism, through revanchism, to early feminism. The next article will look at paintings of the rest of Joan’s brief life. Posted in General, Language, Life, Painting and tagged Américo, Bastien-Lepage, Bénouville, Fortescue-Brickdale, Melchers, narrative, painting, Redon, revanchism, Siemiradzki, Thirion, Waterhouse. Bookmark the permalink.